Scientific name: Typha domingensis (Pers.) Steud. Synonym name: Typha angustifolia Bory & Chaub., Typha australis Schum. & Thonn. Typha, typhos (Greek), "marshes", a name that has been written for these plants since Theophrastus (372-287 BCE) called them tiphe (τὐφη) and Dioscorides (40-80 CE) wrote tiphes (τυφης). ”Typha is linguistically related to Typhon, typhoon, and typhus. These words link four concepts - monsters, storms, diseases, and plants. Typhon, as the father of the Winds, causes dangerous storms. This deity’s name is cognate with “typhoon,” borrowed from the Arabic, Persian, and Urdu وافن tufân (to turn around), and still in use to describe violent cyclonic storms of the Indian Ocean. domingensis, meaning from Dominica, refer to the plants's native habitat. angustifolia, Latin angusti-, narrow; narrow-leaved. The standard author abbreviation Pers. is used to indicate Christiaan Hendrik Persoon (1761 – 1836), born in South Africa, a lichenologist, mycologist and taxonomist. The standard author abbreviation Steud. is used to indicate Ernst Gottlieb von Steudel (1783 – 1856), a German physician and an authority on grasses. The standard author abbreviation Bory is used to indicate Jean Baptiste Bory de Saint-Vincent (1780 – 1846), a French naturalist. The standard author abbreviation Chaub. is used to indicate Louis Athanase Chaubard (1785 – 1854), a French botanist. The standard author abbreviation Schum. is used to indicate Karl Moritz Schumann (1851 – 1904), a German botanist. The standard author abbreviation Thonn. is used to indicate Peter Thonning (1775 – 1848), a Danish physician and botanist. as in the passage from Jonah 2:5. The word yam in Hebrew is the ordinary word for "sea," although in Hebrew it is used for any large body of water whether fresh or salt. The word suf is the word for "reeds" or "rushes," the word used in Exodus 2:3, 5 to describe where Moses' basket was placed in the Nile. So, the biblical reference throughout the Old Testament is to the "sea of reeds" (e.g., Numbers 14:25, Deuteronomy 1:40, Joshua 4:23, Psalms 106:7. etc.). 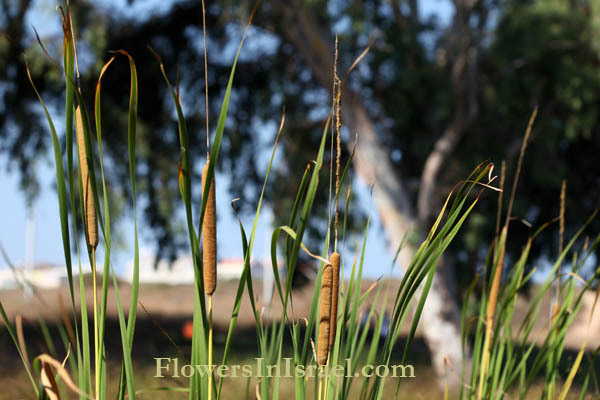 In Exodus and Isaiah suf can be translated as Typha; in Egypt it was called tupai. Two species of Typha dominate in Egypt: Thypa elephantina and Thypa domingensis. Typha is used by people around the world as a source of food and household items. Jerome (Eusebius Hieronymus, 347-419), used harundine in the Hebrew to Latin translation of the Bible, the Vulgate. Harundo, the basis of harundine, can mean reed, cane, fishing rod, limed twigs for catching birds, arrow shaft, or pipe. Because of the Hebrew or Vulgate reference, the Christians of the Middle Ages began using cat-tails in artwork. Typha appears as part of the scenery in the tapestries of unicorns; both plant and animal were allusions to Christ. Paintings by Flemish artist Sir Anthony Van Dyck (1599 – 1641) of Jesus’ mock trial have him with a cat-tail in his hand as a scepter. Even Leonardo da Vinci (1452-1519), included Typha. "Of tzité the flesh of man was made, but when woman was fashioned by the Creator and the Maker, her flesh was made of rushes. These were the materials the Creator and the Maker wanted to use in making them". 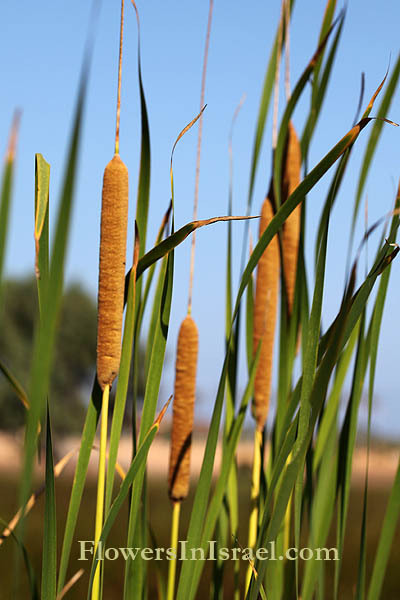 Typha has been involved in not only secular life, but played prominent roles in people’s sacred lives. Then Pharaoh’s daughter went down to the Nile to bathe, and her attendants were walking along the riverbank. She saw the basket among the reeds and sent her female slave to get it. Under the lotus plants it lies, hidden among the reeds in the marsh. Smoke pours from its nostrils as from a boiling pot over burning reeds. Rebuke the beast among the reeds, the herd of bulls among the calves of the nations. Humbled, may the beast bring bars of silver. Scatter the nations who delight in war.